When it comes to choosing a pair of binoculars for use on the water, there are countless models and brands on the market to choose from. In most cases, it is worthwhile to spend money on a good set of binoculars. However, if you still don’t know exactly what you are looking for, making the right decision can be quite difficult. Some common points which you should become familiar with include: What is the difference between 7x50 and 8x32 binoculars? Are coated lenses important? Are there watertight optics? In the following text, our SVB experts clarify these key points and highlight which are truly important, as well as illustrate what is absolutely necessary for marine binoculars to have. Find out more about our extensive range of maritime binoculars in our Binoculars category. Binoculars are described using two numbers, such as 7x50 or 8x25. The first number describes the magnification. The second is the diameter of the objective lens in millimetres. Magnification power describes how much closer objects appear when you view them. In 7x50 binoculars, the image is magnified sevenfold. Increased magnification reduces the brightness of the image, so as the magnification increases, binoculars require increasingly larger objective lenses to maintain overall brightness. The larger their size, the more light they can gather. "The magnification of marine binoculars should not be too large." Binoculars for bird watching or stargazing offer too much magnification for use on board. The more an object is enlarged, the more difficult it is to keep it in view, therefore a magnification of x7 is ideal for use on vessels with a length of up to 15 meters. Marine binoculars are more prone to exposure to the elements than conventional models. Binoculars can also easily fall off of surfaces or out of your hands in rough conditions at sea. Water exposure is also an issue when using binoculars in a marine setting, so getting a pair which is water-resistant or at least water-repellent is definitely worth considering. 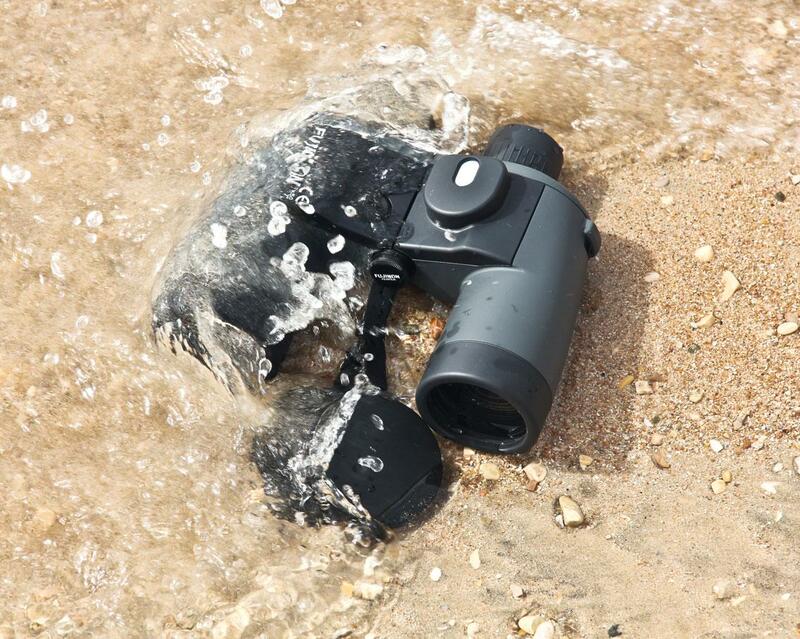 "Waterproof binoculars are a must for any water sports enthusiast!" Binoculars used on water are always exposed to very high humidity and splashing water. In combination with constantly changing temperatures, the lenses can quickly fog up internally and externally, rendering them unusable. For this reason, waterproof housing with an inner O-ring, filled with nitrogen, protects your binoculars from moisture and the ingress of water. 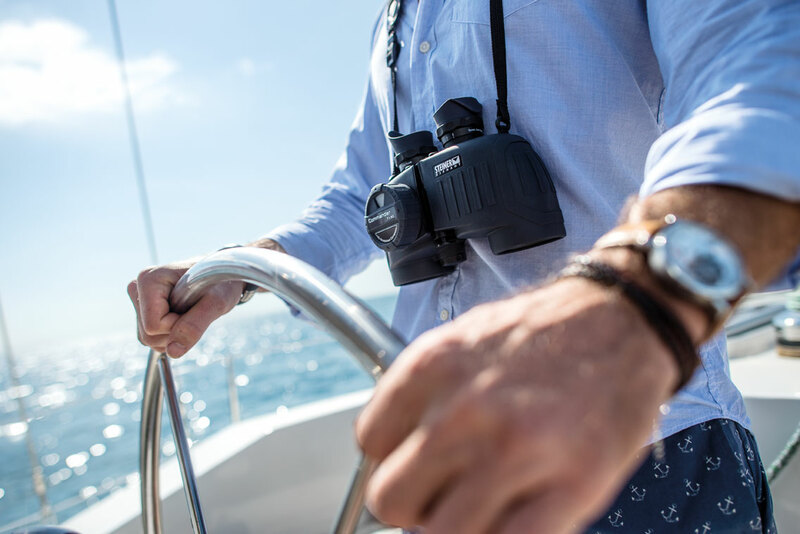 In any case, our SVB experts recommend that you purchase waterproof binoculars, such as those made by STEINER, especially if they are to be used regularly in marine environments. Do binoculars have to have an integrated compass? What are the advantages? Built-in compasses which appear superimposed on the lens allow the user to take on the course of an object which would not be visible on a set of conventional binoculars. 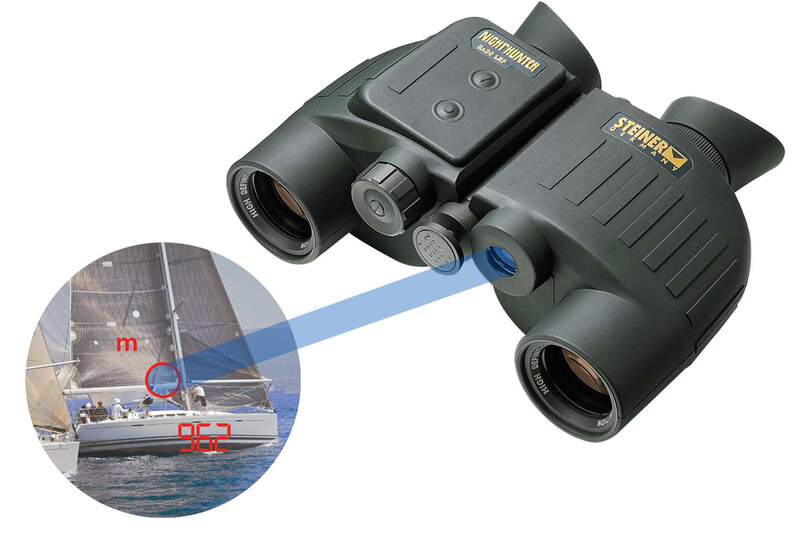 Binoculars with an integrated compass can be very helpful when navigating on board of a vessel. If you are faced with the choice between: binoculars with a compass or binoculars without a compass, our SVB experts recommend that you always purchase the version with a compass when the binoculars are to be used in an active environment. Do binoculars need an automatic rangefinder? There are binoculars which have built-in laser measuring technology for determining the distance of a targeted object. This new technology is ideal for use on the water in combination with a built-in compass. The distance to an object is measured within a few seconds with the aid of a non-visible laser, which helps to prevent dangerous situations or collisions from occurring. An automatic rangefinder isn’t always necessary on board, but it can be very helpful, especially if you are on the water frequently. Binoculars can have independent eyepiece focus, which compensates for the differences between the eyes of different users and changing distances between the user and the object. For center-focusing binoculars, the eyepiece can be adjusted to compensate for your individual eye strength. After your individual eyes have been set into focus, a focus knob is used to uniformly adjust the distance of both sides. 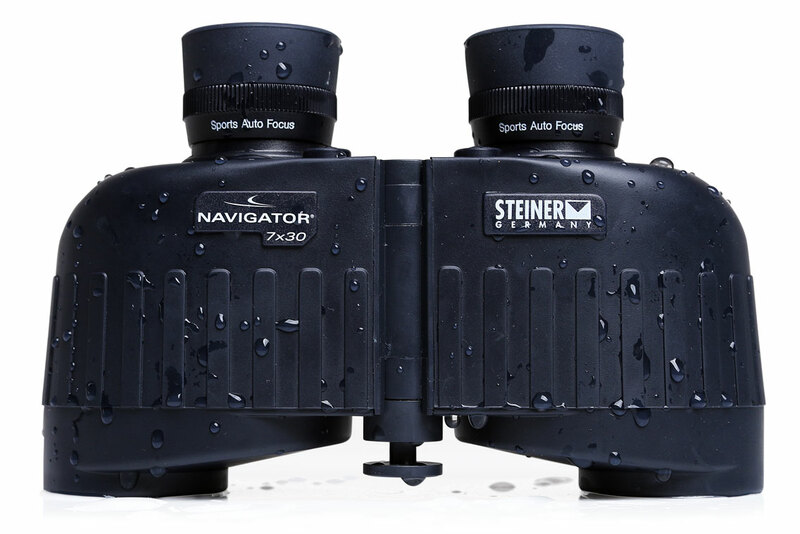 Steiner binoculars use fixed focus with a very wide depth of field. This focus function is called "Auto Sport Focus", which provides a sharp image without having to continually refocus. Once adjusted, your Steiner binoculars automatically adapt to different situations while in this mode. This is ideal, especially during poor weather conditions on board, in order to be able to quickly switch between different observation distances without having to readjust. Your budget - How much would you be willing to spend on binoculars? The SVB Shop and the SVB catalogue both offer a wide range of binoculars, from entry-level models to high-end professional units. Prices range considerably, from under €40 to several thousand euros. In general: Great binoculars with brilliant, contrast-rich images are quite expensive, but their incredible functionality and performance pays off! 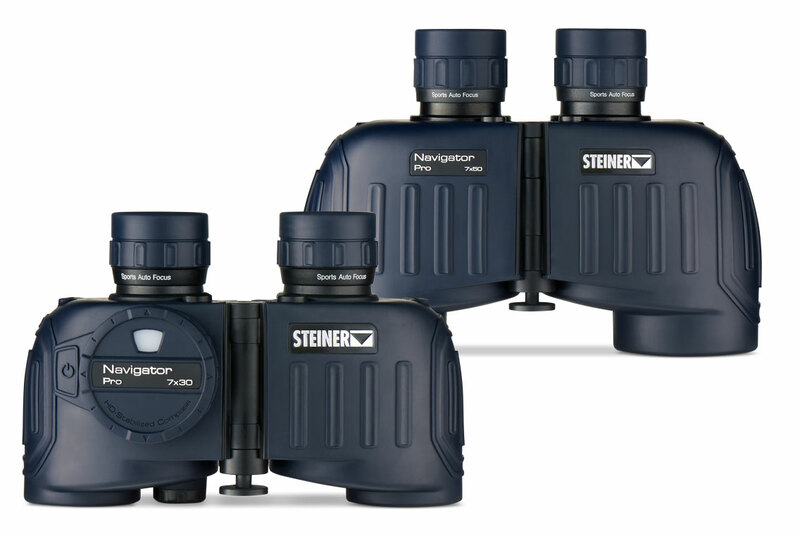 For maximum optical performance and robust mechanics, which also withstand moisture, cold and heat, we recommend choosing one of the high-end binoculars from Steiner. The differences between premium binoculars and lower-end models are truly remarkable, making spending the extra money absolutely worthwhile in the long run. The relative brightness of an image - the larger the lens, the brighter the image! The relative brightness of a binoculars’ image is an indication of the functionality of the optics. Having a high level of brightness is particularly important in twilight. The brightness can be calculated with the help of the binoculars’ dimensions: (lens diameter / magnification)². It’s evident that a larger lens provides greater brightness: a binocular with a lens diameter of 30 has a brightness of 18.3 ((30/7)² = 18.3), while a binocular with a lens diameter of 50 has a brightness of 50 ((50/7)² = 50)! In this case, the relative brightness of the image is increased by 177%! It is therefore worth investing in a higher-end set of binoculars with larger lenses, in order to benefit from a higher degree of brightness which will in turn improve image quality in any situation. The use of state-of-the-art materials is setting new standards in optical performance and durability. Cheap and poor-quality lenses don’t allow as much light to reach your eyes – usually only about 70 - 75% of the total amount. Top models by Steiner and FUJINON normally let much more light pass through, depending on the model! These binoculars allow up to 97% of incident light pass through the lens, which means that objects are displayed much brighter and sharper compared to cheaper lenses. This not only facilitates improved sight, but it also makes your eyes less prone to fatigue. Binoculars’ lenses receive a chemical coating during the manufacturing process, which not only protects them against scratches, but also reduces the effects of reflections, thus increasing overall light transmission. This coating is noticeable by its distinct colouration. The less colour you can see, the better the coating generally is. When light reaches the binoculars, between 5 and 10% of it is reflected away by the glass, which consequently does not penetrate the eye of the user, thus making objects appear less bright with poorer contrast and clarity. Ultimately, having a high quality coating on your binoculars makes it possible to reduce the amount of reflection significant.